It seems hard to believe, but it has now been 9 months since my last hair dye. See the video below for a short & sweet update, featuring a slideshow of my progress at the end. Wash once a week with Neutrogena Anti-Residue Shampoo (to fade the dye) and follow up with Living Proof Perfect Hair Day Conditioner. On Saturday, I wash my hair with Joico Blue Shampoo, followed by Joico K-Pak Intense Hydrator. It’s time for a change, however, as my ends are becoming not just blorange, but downright ORANGE! Just call me “Bozo the Clown” – that’s how orange they are. To combat the orange, I’m going to try a new product this week and will post the results shortly. One thing I can’t figure out – why are my dyed ends darker than the faded dye in the middle of my hair? Doesn’t it seem like they should be the lightest since they’ve had more time to fade? Multi-colored hair, with the ends being the darkest. Whaaat? 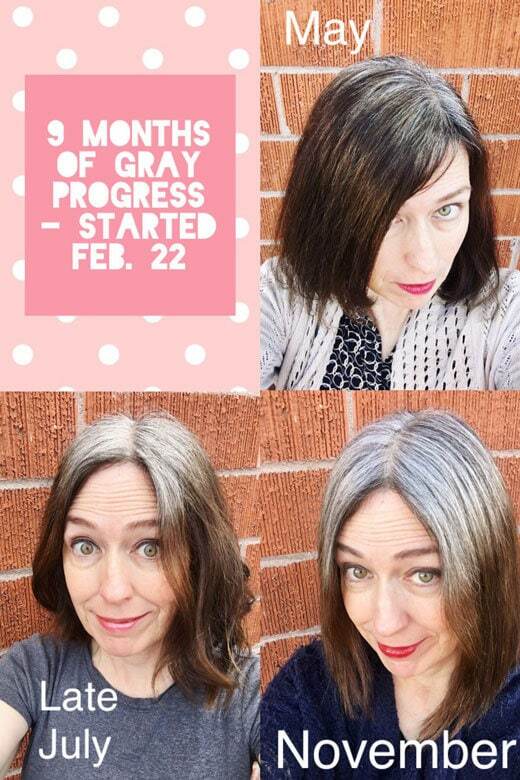 This is what I like about going gray: these little mysteries. It’s fun! 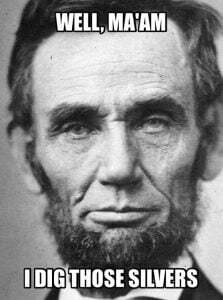 Speaking of fun, I had a dream the other night that Abraham Lincoln and I were involved in an intense discussion…about my gray hair! Do you dream about your gray hair? 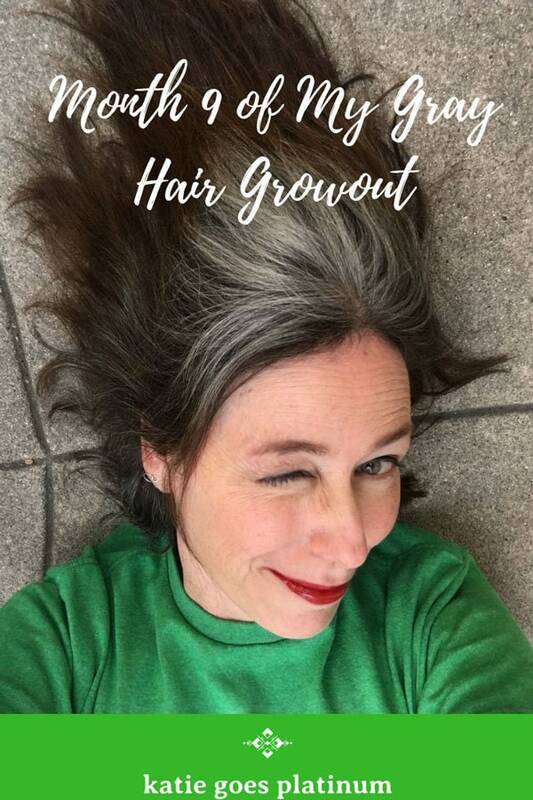 A lot of women in the gray hair community have had nightmares where their hair was dyed against their will. Have you experienced this? In my 8-month transition post, I said I was going to experiment more with colors. I’m still on a tight budget, however, so I have not been able to go clothes shopping. I think it’s time to raid my closet and dresser and see what I can find. It’s definitely time for some color to go with this lighter hair! My first experiment with braids. I’m making a face as I realize this is not easy for me. I’ve started experimenting with braids! I don’t know about you, but my manual dexterity is not great – so I haven’t gotten very far. A reader recommended this YouTube braiding tutorial and I want to try some of these, how about you? If you’re into braids, check out my silver sisters Carla and Heidi on Instagram for some great braids – these ladies are super-talented! Some cosmetics companies have reached out to me to review their products! Many of these products are geared specifically to mature women. I still have a lot to learn about skin care and cosmetics, but I will be learning as I go and will post the results here. My first review will be for City Beauty. Their products are cruelty-free, and so far, they all seem to be very high quality. I’ve loaded it up the shop with products that I personally recommend, as well as products recommended by our silver sisters in their Silver Hair Transition Stories. Am I missing anything? Please let me know! The blog has had 25,587 visitors and 56,662 page views. That’s it for my 9 month gray hair progress report. Not only do other women suggest that I dye my hair (I too stopped due to a severe allergic reaction), but that I cut my strap length hair into something “more age appropriate.” There’s not one thing wrong with short hair, just not my thing since I got chopped in Navy basic years ago. I am happy to find this! It’s so frustrating. Haven’t these ladies learned that it’s not polite to comment on someone else’s appearance? (Unless it’s a sincere compliment, of course!) . I don’t know why so many women insist that older women cut their hair off. I don’t like myself in short hair, and that’s all that matters. Sounds like you are doing what YOU want to do, which is great, Norma! I’m so tired of dying my hair so I’ve decided to let it grow out. I’m thinking of purposely putting grey highlights in to help with the transition. Has anyone done that…how did it go? H, Kristie – You should check the Silver Circle and Silver Revolution Groups on Facebook to see what other women have posted. 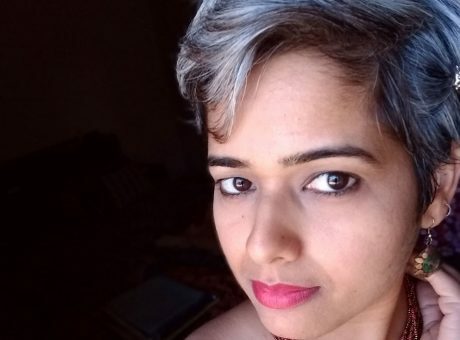 It seems that many women with dark hair have had issues with their hair being damaged by the highlights/lowlights process because of the bleaching that is involved. But women with lighter hair have had more success with it. 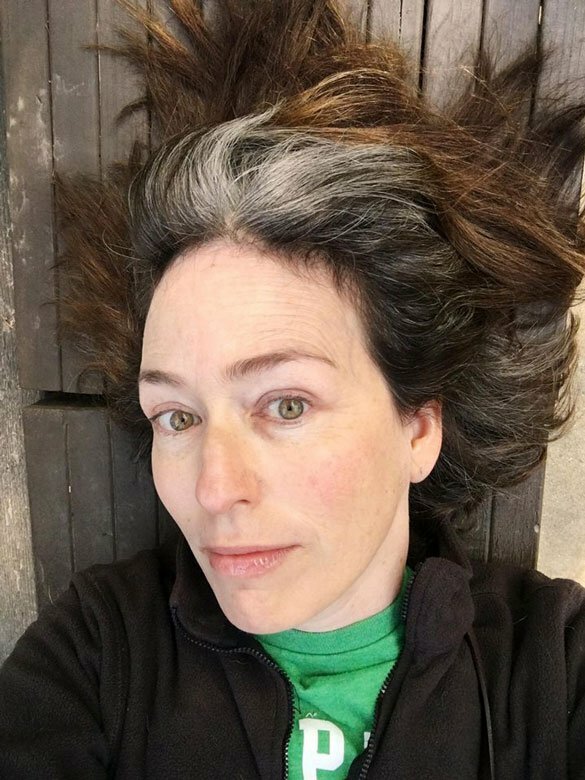 I am 40 and currently going natural (which is maybe 1/3 grey now) for the second time. Am I the only person that’s done this?? Maybe. 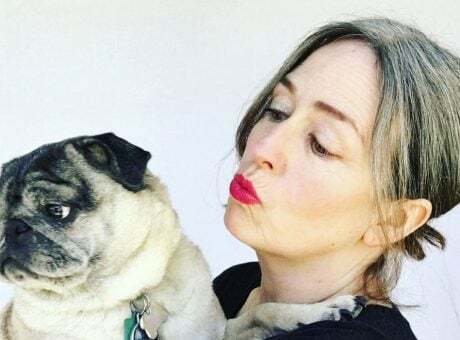 I grew it out completely and had lovely natural shoulder length grey brown hair only a year ago, but after a messy breakup caved to peer pressure and the hope of feeling better with a different hair colour. Six months later I started growing it out again! Last time I went straight from dark brown and just let it grow. This time I had it turned blond first. It’s the first time I’ve ever had any blond hair so that’s kinda weird. I’m not sure if it’s better, but it’s different so it’s like a whole new science experiment! I also am leaving it shoulder length this time instead of getting short cuts. Being patient! How interesting that you’ve gotten to experience different kinds of transitions. It sounds fun! Good luck! Kelly, I totally get you! 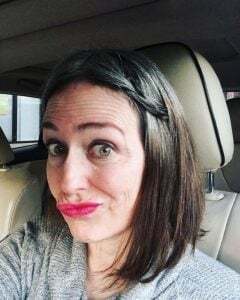 I went gray young, so in my mid 30’s I stopped coloring my hair. Over the past 7 years I had a lovely shade of very gray hair going on. 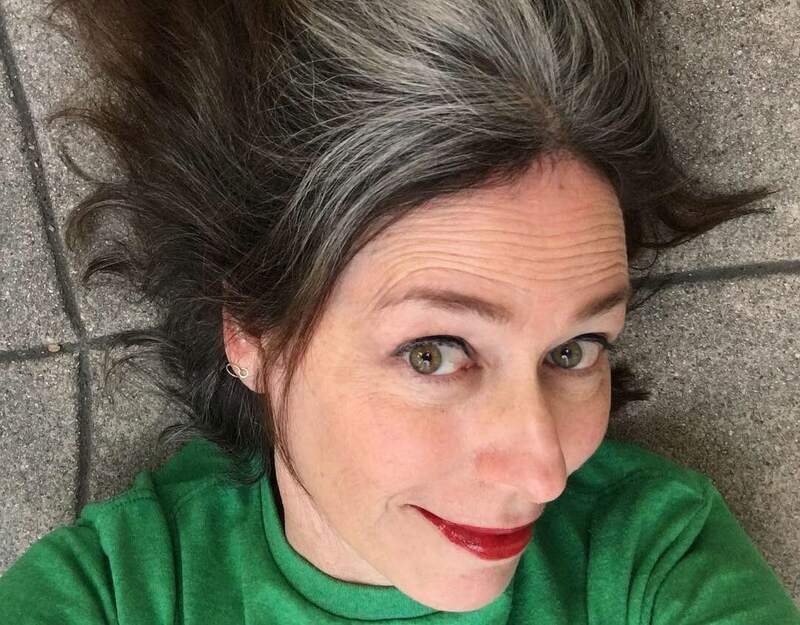 I had so many compliments and affirmations on my bravery of going gray. But a hard break up made me cave and I’m back to coloring my hair. I’m 44 and back in the fuss of roots and oh what a mess! I’m not sure how long I will last. How do people afford this year after year???! I miss the simplicity of my gray hair. And I plan to return. It’s online supporters that help me with re-making that step. 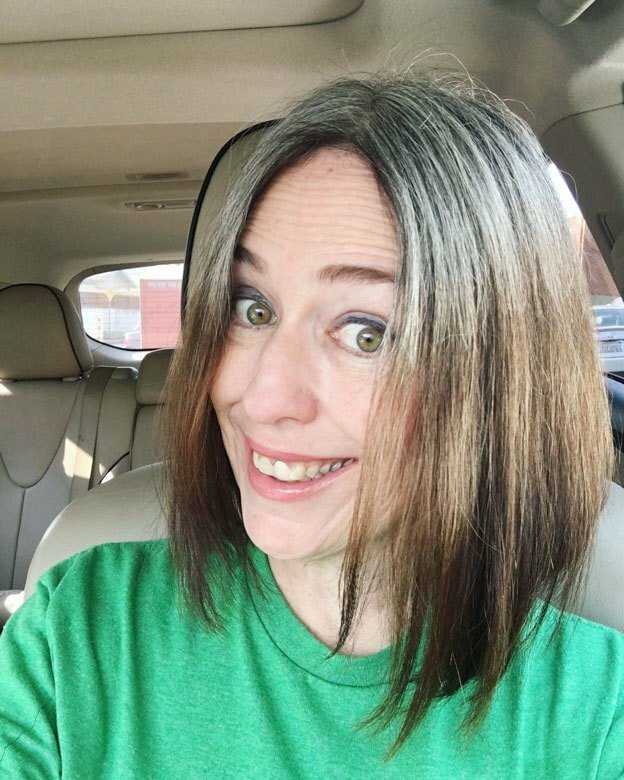 I am 44 years old and I decided also to stop dying my hair on March this year. Now I really enjoy having my gray hair. I love long hair…. It’s still growing up….. next to my neck only…. It’s great to be here and enjoying our transition in a sisterhood fashion! I loved your video and can’t wait to see more! Your hair is looking great! Mine is still at that ‘what the hell is that white blotch on her head? !’ stage lol. I’d say that the dyed ends of your hair are stubbornly darker because they’ve absorbed multiple dyes. Whereas the dyed bits closer to your head have been dyed less over time and therefore strip colour quicker. Mine is the same. I am definitely noticing other women’s hair more. I especially love it when I see women with transitioning hair. I always hesitate to approach them, in case they don’t want to be “outed” – but if they have a head of beautiful gray hair, I’ll make a point to compliment them! Thanks Katie, the darker ends it’s because the ends get saturated with color dye from all the times you colored it and the middle had less dye deposit. The transition is long but the end result is so great. Someday I will make a video of myself showing how I do my braids. I would love to see a video of you doing your braids – the one you posted today was sooo gorgeous! This is so much fun! Abraham Lincoln? Hilarious! And it certainly is strange that your ends are darker than the faded dyed hair in the middle of your head. There has to be a practical solution, but I sure cannot come up with anything. Isn’t that hilarious about Abe Lincoln? I wish I could remember exactly what he said!